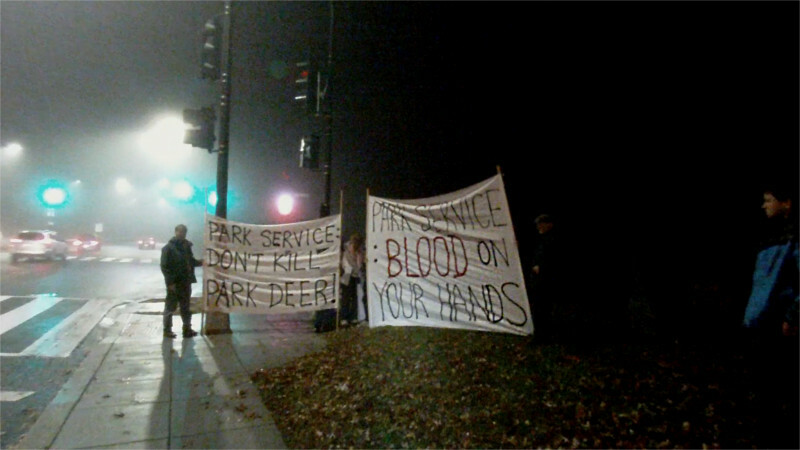 On the evening of 28th of November, the Park Service set up the usual barricades and flashing lights indicating preparatons to shoot deer. By a little after 9PM they disappeared, protesters having threatened to deploy. The Park Service had warned people to be off the trails by 8PM on both Monday and Tuesday nights. They were expected to try again Tuesday, Nov 29 but once again did not show up. Protesters were there instead, and had announced they were coming. 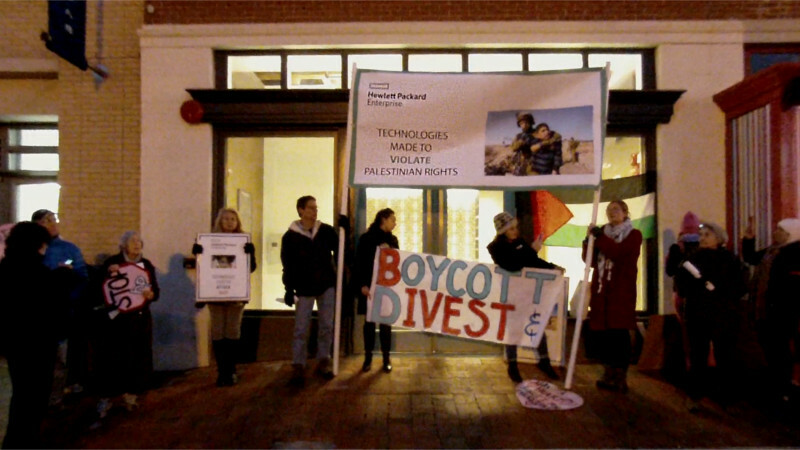 On the 28th of November, Code Pink protested Hewlett-Packard's sale of biometric and identity-tracking software to Israeli prisons, settlements, and the Israeli government in general for use at checkpoints. During the protest, someone came out the door-and the open door let in several members of Code Pink, who stopped further traffic in and out by turning the elevator into occupied territory of a different kind. 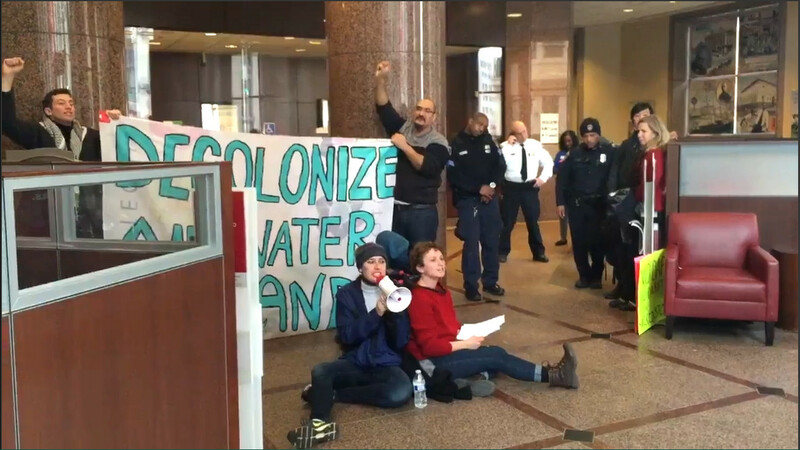 On Black Friday, the 25th of November, water protectors in Baltimore locked down inside a Wells Fargo bank branch, forcing them to close down for the day. Six activists were arrested after being cut out of the lockdown, which defeated the first tools used to try and cut them out. 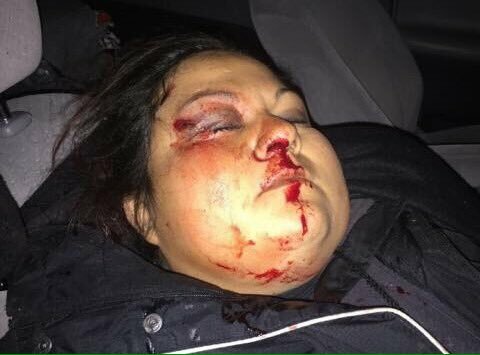 O ne activist indigenous to Mexico had to be taken to the hospital after being injured by police. 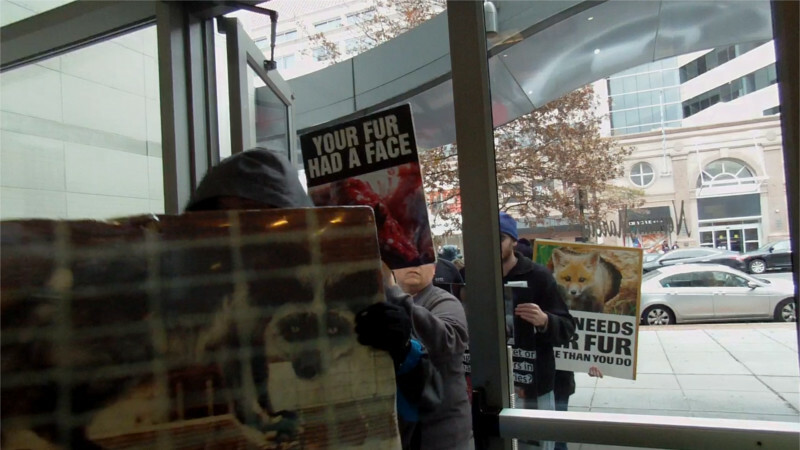 On Black Friday, Nov 25, animal rights protesters marched into Neiman-Marcus, demanding the upscale chain store stop selling fur and related products. Afterwards they marched around the block, stopping at Maggiano's, the scene of the previous week's confrontation with the neo-Nazi National Policy Institute. The Shortwave Report 11/25/16 Listen Globally! Read more about The Shortwave Report 11/25/16 Listen Globally! #Disrupt J20: No Peaceful Transition to Trump's fascist regime! 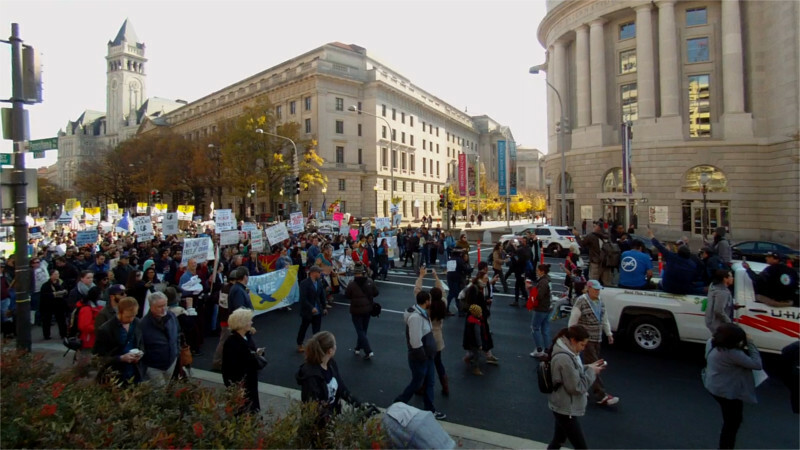 On the Nov 14, Crimethinc and SubmediaTV published a video in multiple places made in the Anonymous style promoting the upcoming protests against Trump's inauguration on Jan 20, 2016. The video explicitly states "the parade must be stopped" and advises "wear black." For protesters to take and hold Penn Ave would probably force the cancellation of Trump's parade, much as extreme cold cancelled Reagan's second Inaugural parade. 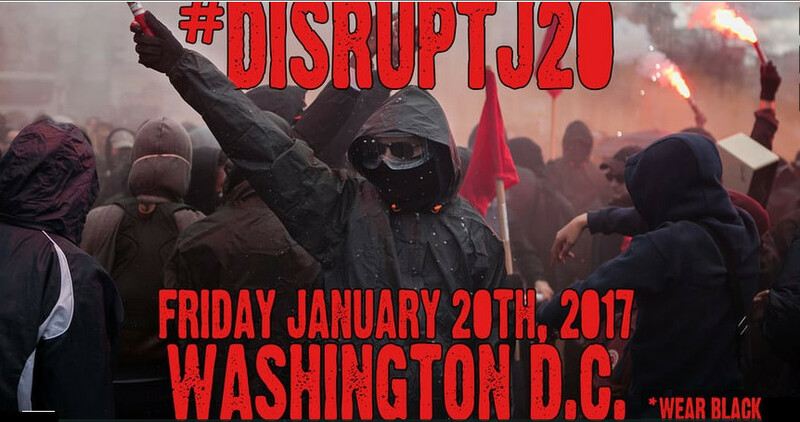 Read more about #Disrupt J20: No Peaceful Transition to Trump's fascist regime! On the 21st of November, some folks who earlier had protested the appointment of climate change denier Myron Ebell to Trump’s transition team stopped by Trump Hotel with a high powered projector. 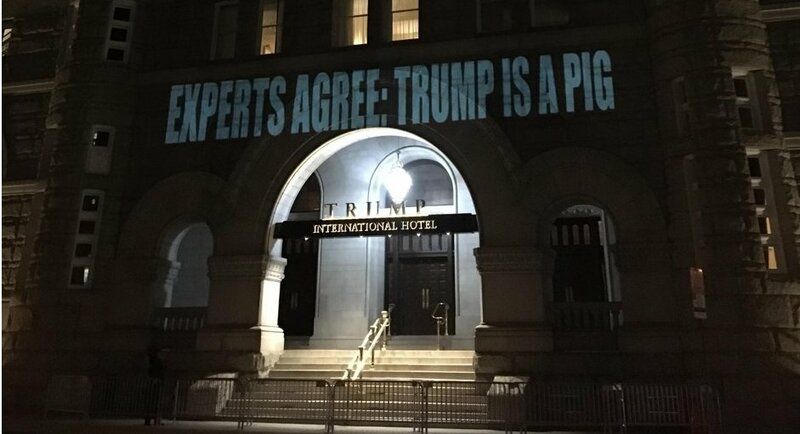 They used it to project the words "Experts Agree-Trump is a Pig" over the barricaded doorways of Trump Hotel. 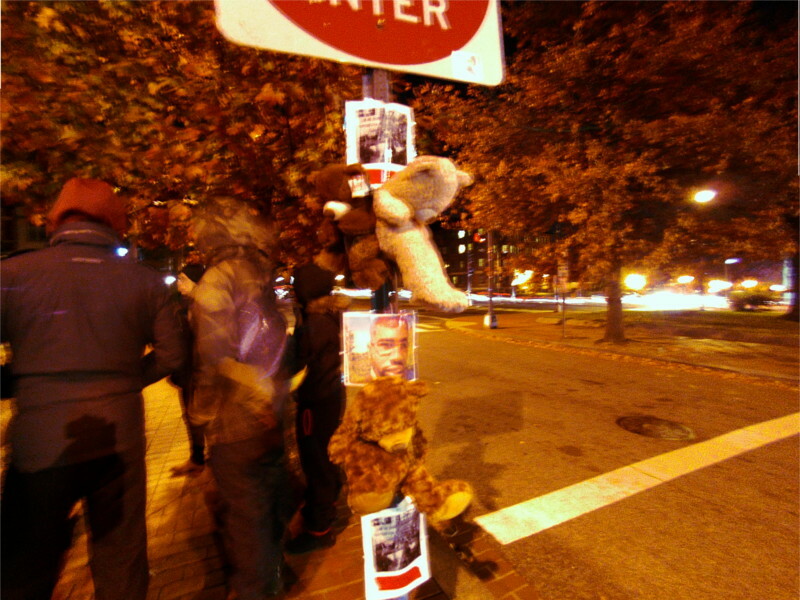 On the 21st of November, activists demanding justice for Terrence Sterling once again gathered at 3rd and M sts NW where he was murdered by police. On Sep 11, 2016 a DC cop shot him off his motorcycle for "erratic driving." Due to the pressure put on Mayor Bowser by Black LIves Matter activists this case has been referred to a grand jury for "investigation." No prosecution will result unless the pressure continues, so activists are still gathering at 3rd and M each Monday night at 7PM. 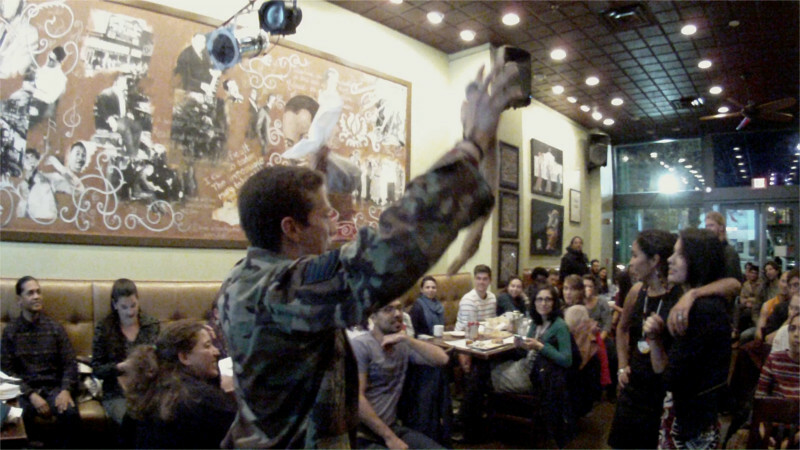 On the 21st of November, the DC Stands with Standing Rock Coalition held a night of prayer,drumming, singing, and culture in a packed room at Busboys and Poets. This was the day after a brutally violent police rubber bullet and water cannon assault on water defenders at Standing Rock injured almost 200 people. The new film "beyond the red lines – system change not climate change"
Overnight Nov 21-21, the Morton County Sheriff's Department opened fire with water cannon in subfreezing temperatures, with tear gas, and with rubber bullets on water protectors who had set out to clear a highway barricade held by police since the assault on the Treaty Camp which had blocked the route of the Dakota Access Pipeline.Over 300 people were injured by this storm of "less lethal" weaponry unleased by police probably empowered by Donald Trump's election. Update Nov 22: Water Protector faces possible amputation, Reported injury count rises to more than 300, water protector Sophia Wilansky faces second surgery in attempt to save her left arm. She was critically injured by a "concussion" grenade thrown or shot by police. These grenades do not throw shrapnel as frags do but they are still high explosive devices and can inflict blast injuries at close range same as any other explosive device. IMF Says Global Economy Faces a "Delicate Moment"